It’s been very frustrating for me to be forced into going back into my old, sedentary ways because of my ankle. Prior to my injury I was running a few mornings a week and going to the gym a couple more. I’d just had a tour at a local gym that run tons of classes and I was looking forward to trying lots of new things. It’s made me realise how easy it is to stop being active – suddenly those evenings and weekends at the gym have been taken over by other things and I’ve got quite comfortable with not having a 6.30 wake-up call to go running in the freezing cold and the darkness that will now befall my morning runs. At times like these it’s hard to get motivated. It would be easy for me to push fitness out of my life and go back to scoffing chocolate on the sofa, having takeaways a couple of times a week and not doing anything to balance it out. Somehow I found that being active also made me resolve to eat better – knowing I’d spent an hour running to blast away the equivalent in calories of Mars bar made me look twice at one in the sweets aisle. And once you start seeing the results of regular exercise it’s hard to want to take yourself two steps backwards with a bad diet. Now I’ve stopped exercising I’ve seen a whole load of bad habits creep back in, especially with there being so many yummy foods around over Christmas and a tendency to hibernate from the chilly temperatures and gorge on snacks around this time of year. It’s like my entire resolve has turned into one big case of ‘stuff it, pass me the crisps’. When I was running and gym-ing a lot I started following quite a lot of fitness types on Twitter and Instagram. These days when I wake up and check social media (because most of them are American), I’m presented with a whole load of photos of women lifting weights, running along the beach, exposing eye-watering inducing six-packs and generally making me feel like I probably shouldn’t roll out of bed and tuck into a croissant. I find these photos really motivating, and they leave me itching to get back into the gym and working towards the progress I was making before the sprain. Because I went on holiday for about 10 days the week before the sprain I’ve actually put on about 6lbs in the last couple of months which I’m determined to try and get rid of some of before the inevitable carb-fest which is Christmas. Finding inspiring role models plays a massive part in giving me motivation to get back out there pounding the pavements (or into the pool until my ankle is ready for that again). It was actually a ‘fitspo’ site that got me into running in the first place and I definitely feel more excited about sport and fitness when I hear about other people’s achievements. One of my favourite stories to reflect on when I’m feeling a bit lazy is that of Kathrine Switzer. 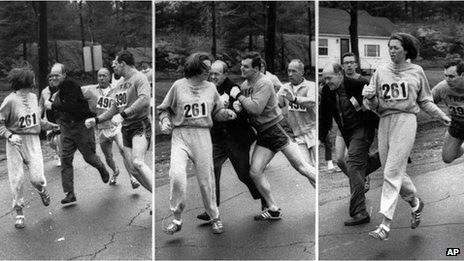 She was the first person to run the Boston Marathon as an official, numbered entry in 1967. The story goes that Kathrine began training for the marathon with her trainer Arnie Biggs. At that time the idea of a woman running a marathon was completely unthinkable, so much so that there were no rules banning them from doing so. It was generally thought that a woman would not be capable of running 26 miles. Kathrine registered with her initials and surname (K V Switzer). She turned up with her boyfriend and they both started running with no problems. Until the two-mile mark when officials tried to evict her from the course. In a rage, race director Jock Semple came lunging towards her, shouting for her to surrender her number and “get the hell out of my race” as well as grabbing her by the sweater and trying to pull her off the course. Luckily, her boyfriend at the time was a football player and managed to slam Jock right off the track, as you can see from the photos below. Kathrine says that as she passed the 20 mile mark she realised that at the end of the race she was: “going to try to be a better athlete and try to create opportunities for women so they would experience the same sense of power, strength and freedom that I had.” And she has certainly done that. Since that day Kathrine has run 35 marathons, winning the 1974 New York City marathon. After the Boston Marathon in 1967 when Kathrine ran, the Amateur Athletic Union banned women from all competition with male runners, on pain of losing the right to compete. Switzer, along with other female runners, tried to convince the Boston Athletics Association to allow women participate, and they were finally allowed to do so officially in 1972. I remember reading about Kathrine in a running magazine about a year ago and being stunned that only just over 40 years ago women were not allowed to enter the Boston Marathon (by 2011 43% of the runners were female). It doesn’t feel like that level of discrimination should have happened in my parents’ lifetime or in a timeframe where there would have been press cameras and journalists there to capture it. Next time I’m feeling like I can’t be bothered to go out and run I will be thinking of Kathrine who had to physically fight for her (and our) right to do so.